Applications: Accelerated Solvent Extraction Devices and Pressurised Solvent Extraction Devices Working at High Pressure Level - (ASE-200, ASE-300, ASE-350 from Dionex). 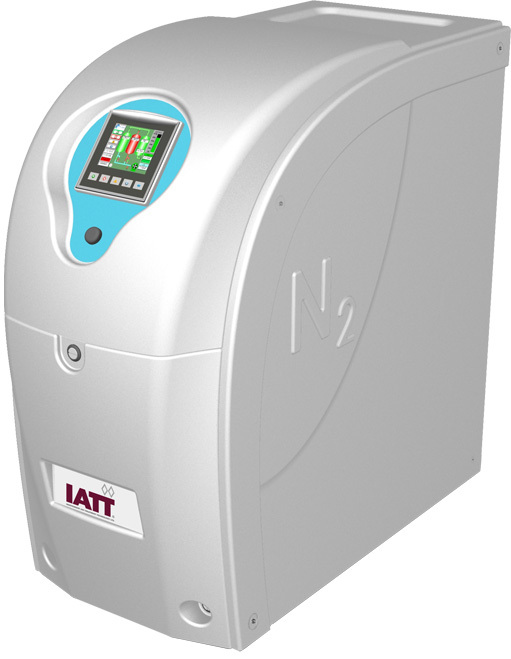 The AiroGen® High Pressure Nitrogen Generator from IATT uses a Carbon Molecular Sieve (CMS) to selectively remove oxygen and other contaminants from atmospheric air. The CMS bed alternates between purification and regeneration modes to ensure continuous nitrogen production at high pressure. Fully regenerative PSA technology - Reduces risk of gas contamination. High pressure nitrogen > 11 bar. Integral oil free compressor offers a fully secure N2 supply. Quiet operation using a soundproofed compressor enclosure. Audible and Alarm display with help menu. Energy saving Mode: Enables the compressor to switch off when nitrogen supply is not required with the external N2 tank. Can be fitted with wheels for mobility.